Fibromyalgia fatigue is another term used to describe the unrelenting and unforgiving chronic fatigue that's associated with this condition. It's an ever present issue that's extremely difficult to overcome without an effective treatment option. 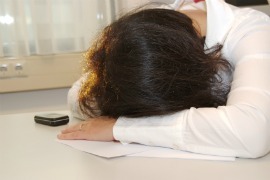 Extreme fatigue can disrupt many areas of your life including the ability to concentrate or perform simple tasks that were once considered second nature. Many people have also lost their jobs because of the inability to perform duties required by their employers. Daily intake of energy drinks and coffee slowly increase, until calling in sick is the only option. Relationships are also strained because of the extreme stress it puts on individuals and their families. Many will attempt to sleep longer hours to try and overcome this lack of energy; only to be disappointed time after time. There are many theories as to what causes chronic exhaustion in fibromyalgia patients. Some experts believe it's due to a weak immune system or lack of key vitamins and nutrients. Others believe it's due to hypoglycemia or carbohydrate intolerance brought on by constant muscle fatigue and the body's inability to break down certain foods. Regardless of these specific reasons, many would agree that this is by far one of the most difficult symptoms of fibromyalgia to deal with. to help stabilize blood sugar levels or replenish well needed vitamins and minerals. There are many treatment options to choose from, but I've tried to list the most effective and influential derived from personal experience and positive reviews from friends and family members that also have fibromyalgia. Many are still being studied and questioned by experts, but we hope to provide you with enough information to help you make your own decisions on what path you would like to take. If you've recently been diagnosed with fibromyalgia, or haven't been put on an effective treatment program, it's time to eliminate this relentless burden once and for all. I feel strongly that you'll find the answer you're looking for here.